Thank you all for you sweet comments on the skirt. It was such a pleasure to knit and has quickly become my favorite FO (aren’t most new FOs our favorites though? I guess we’ll really know in a couple years). I omitted a few things in Sunday’s post that I want to add here. First, a big thank you to Lolly for the idea of making this skirt in linen. I wouldn’t have thought of it myself and it was the perfect marriage of yarn and pattern. 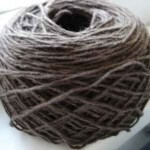 Several of you asked about my experience knitting with a linen yarn. It’s true that the yarn feels more like twine than yarn, but it didn’t bother my hands or effect my knitting experience. However, I knit in a rather unorthodox way so I may not be the best person to ask. I will say that I needed to stop worrying about how uneven the piece looked in its unwashed state. It really looked pretty bad — definitely not something I’d wear out and fess up to having actually made. But after a wash and dry cycle everything evened out perfectly. You’ve also been wondering about saggage. I wore the skirt all day Tuesday and there was a teensy tiny bit of change in the shape of the skirt. I think it was more of a bit of stretching along the back than sagging. Whenever I sat down I’d be stretching it a bit so over the course of a full day the back ended up being 1/2 – 1 inch longer than the front. When I make another cotton skirt I may do a few extra rows in the front with short rows to compensate, but it’s really not bad at all. Julia had warned me that wearing linen as a bottom can be a little rough on your skin, and she was SO right. I had forgotten the comment until mid-way through the day when I realized I had little purl bumps wherever I didn’t have an undergarment. It wasn’t anything I couldn’t handle, but I did have a bit of a laugh over it. Lolly asked for some more details on how I did my skirt in the round and top-down. I thought it might help others, so I’m posting it here instead, as well as some other thoughts that have come to mind in the past few days. It’s a long entry, so you can get the details behind the cut. 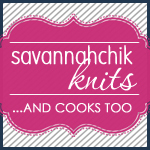 I was at a loss when I first started this project because I didn’t own any knit skirts. My typical approach of measuring something that fit well and go from there wasn’t going to work. After going through my wardrobe I chose 2 skirts that I thought could be helpful. The first was a woven, bias cut skirt. Since it was cut on the bias it had some stretch. The second was a denim skirt with some lycra in it. I measured up both of the skirts (they were very close in size) and decided to cast on for a skirt that was 2 inches larger than the waistbands of my RTW skirts. I added a couple inches because the skirt is a pull-on and needs to go over my hips. It has a drawstring so I knew I could cinch it to fit whatever size I needed. I read through the entire pattern first, to see if there were any gotchas. In this case, it was really a straightforward A-line shaped skirt. Easy peasy. Then, I broke up the skirt into several sections. For this pattern, we have 6 sections (the pattern actually has 7, but I only did 6 because I needed to shorten the skirt). 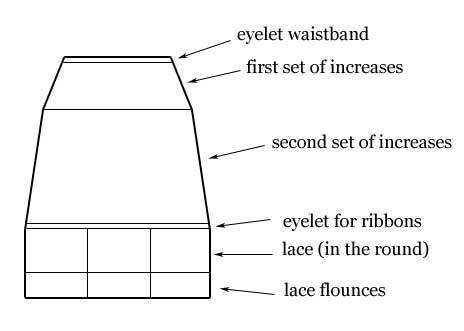 In my diagram, we’re missing the knit straight section that’s above the eyelet for ribbons section. Once you have each section mapped out, it’s pretty easy to concentrate on just that section in the pattern directions. The biggest change when we knit in the opposite direction is that all the decreases need to change to increases. I put a marker at each side, and spaced the increases one stitch out from the marker — giving the increases a 2 stitch gap. I tried a few increases and found that the m1 looked the best in my yarn. then I increased one stitch on either side of each stitch marker every 4th row 6 times. To make sure I was doing everything properly I checked against the pattern’s stitch counts after each section. I did plan to reverse the lace so it would be oriented the same way as the pattern. 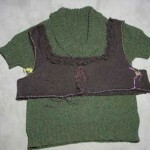 In fact, the first time I knit it I had done just that (I had to rip back because I started the lace too early). By the time I got back to knitting the lace I had forgotten and followed the instructions as is in the book. Truth is, I think it’s fine. It still has a wavy edge, it’s just that the opposite part of the pattern waves up versus down. When I got to the flounces I put the whole piece on a stitch marker and knit one flounce at a time. In order to make both edges of the flounce the same (both starting and ending with a k1), I did a m1 on one edge of each flounce (the edge that would have started or ended with a decrease instead of a k1). 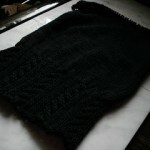 For the bindoff, I did a decrease bindoff — that’s the real name for the bindoff that Evelyn Clark does on her shawls. Thanks go to Kate for teaching me the official name of the bind off. And that’s it. It’s really a straighforward process for as simple of a shape as this skirt. Not that I knew it at the time, but it was an ideal first skirt project — simple lines and not a lot of shaping. I can’t encourage you enough to try a knitted skirt. I am shocked with how much I love it myself. In fact, I’ve already been eyeing up several others for my next skirt. Thanks for the extra details! All those mods paid off! SO much wonderful instruction, Jody. Thank you for putting this together! Who knows – I may just have to start on this over the weekend! Thanks for all the details! 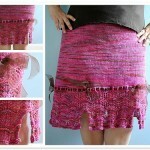 I’m not sure if I’m sold on knitting a skirt for myself, but your post was encouraging. pretty skirt! and it looks very nice on you. i read your blog frequently, but i recently stumbled across it because i am searching for a few extra balls of rowan linen drape in shade 843. i googled it, and your blog came up. do you still have the bag you posted about? could i interest you in any sort of trade? i thought i had 10 balls of it, but i only had 5. so now i have a sweater that I can’t finish unless i find 3 more balls. thanks! and i look forward to hearing from you. It is a beautiful skirt and I’ve marked this page, in case one day I gather the courage myself to try it. So, how sheer is the fabric? I’ve just swatched with Euroflax on US3s and it’s a nice fabric (especially after a full wash and dry cycle as you suggested), but I’m worried that it will be indecent! Although it sounds like knitted linen skirts may be more comfortable with a slip anyway It’s a beautiful skirt, BTW. Love the colorway.